Amuse-Bouche is a playful collaboration with myself, Chef Dylan-Foss (who loves the challenge of creating a delicious, artful, sustainable and organic food menu) and the powerful yet gentle opera singer/ yoga instructor Mark Atherton. 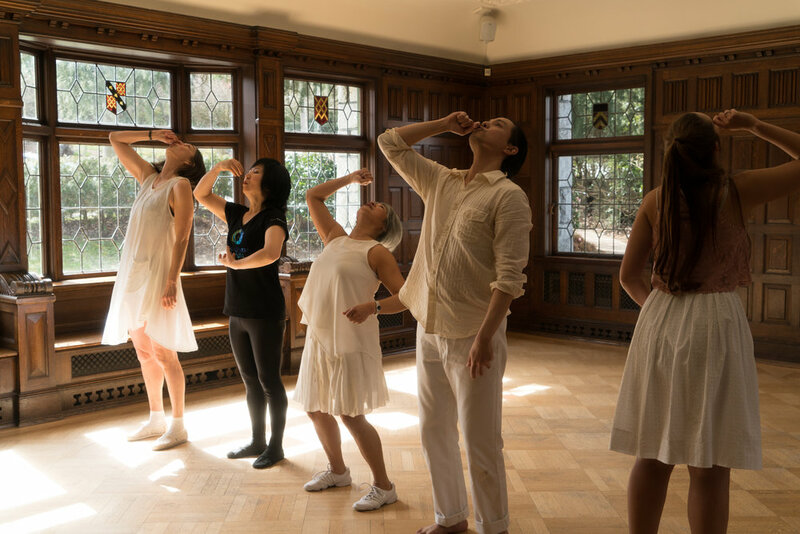 The intergenerational dance cast shares the stage with singer, pianist and chef in this 60 minute contemporary dance production in the dining room and lounge of the Aberthau Mansion/ West Point Grey Community Centre in Vancouver. I believe you will be delighted by our unusual mixture of gourmet food, live vocals (opera, musical theatre and jazz) and piano arrangements as well as contemporary dance choreography that features an intergenerational cast of professional dancers (myself included) and community dancers. My love of collaboration and my desire to win the hearts of both seasoned and new dance lovers, brings me outside the box to provide unique experiences for all involved. In the past I’ve collaborated with astronomers to present at the Tucson Planetarium, and more recently re-visited The Wizard of OZ in No Place Like Home, to whisk audiences through the rooms of the century old Aberthau Mansion. 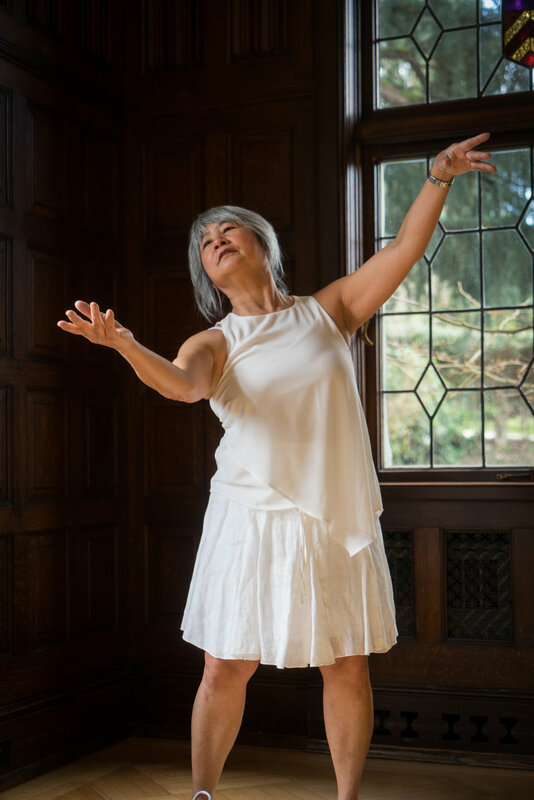 Over the past year and a half I have hosted older adults Creative Collaborative Dance Workshops every Friday at Aberthau Mansion/ West Point Grey Community centre. From that, has grown a group of dedicated artists who have been stepping up their game with me in the realm of dance performance. I would like to personally thank the West Point Grey Community Association and Arts & Health for supporting these workshops. I have brought together an ensemble of professionals including recent SFU dance graduates Rachel Helten, Jenna Kraychy, and Marc Arboleda and apprentice Derya Whaley-Kalaora (Arts Umbrella) with six older adult community dancers ranging in age from 55-70 years. This has been a win win scenario with the younger and older dancers learning from one another and enriching each others lives. I warmly welcome you to join us in this one-night-only, full-blown, sensory extravaganza. Did we mention we absolutely love rehearsing and sharing our work with you at Aberthau Mansion? So many thanks to the West Point Grey Community Association, the staff and Vancouver Parks Board and to all who have made our residency possible! Watch the Amuse-Bouche trailers below (filmed by Willan Leung). I nurture my creativity by opening myself to as many interesting and diverse ideas my day-to-day schedule will allow. And, I dance a lot… yep, I dance quite a bit. Lots of dancing. Lots. Feels great. Oh, and I dance a lot. Nah, definitely New York Cheesecake. DEFINITELY. Feels great. I practice mindfulness to really notice the beauty thats all around me. It's so easy to get caught up in my head and to ruminate. Taking the time to really be in my surroundings brings a fresh perspective and recharges my soul. In turn this helps me feel creative and inspired! I grew up in a musical family so being involved in music was never a question. My love of singing comes from the power of text. Words hold so much meaning. I've seen how words and music can transport people back through time, to memories and events that they hold close to their hearts. I nurture my creativity by creating space to do things I know will bring me into a flow of presence like meditating, cooking, walking through the forest, drawing, dancing and connecting with inspiring people like the ones in this show. I see Dance as the path to greater awareness, authenticity and spiritual development. I assist my students to release what's holding them back from their boldest expression of themselves. I teach people to allow, embrace and even amplify their emotions and provide them with tools to gracefullly process the energy that arises. If I was a food right now I'd be a delicious Pavlova with fresh mixed-berries and heaps of whipped cream. With each bite there is a bit of crunch amidst the sweet and smooth. I have been lucky to find a career that is full creation and that I love. When in a creative dry spell, a change of season usually can get me firing again. Another strategy to stoke the fire is cooking for loved ones. The act of cooking for people is spiritually significant for me and always nurturing for me and the ones receiving my creations. If I were a food I would be food that is organic and grown by friends who farm as it's always very lush, vibrant and full of nutrition. My relationship with dance generally takes place at a friends party where you can cut lose and be totally silly with special people. I also believe that dance helps us to feel comfortable in our bodies in the reserved Canada we live in, it challenges up physically, emotionally and socially. As someone who like to rock the boat, it's perfect. I dance often. In every shade of my being. In dark rooms, kitchens, studios, the stage, in forests, beaches, in dirt and water. At times my spirit dances to sounds of stillness. Other times I'm moved by rhythms raucous to serene that quicken my heart and mind. I sing often. In all the aforementioned places. But it all began in a bath tub or in my mother's presence. To put shape to what perplexes and enchants me I write also. Be it poetry or random musings scribbled in my journals. Other times I memorize lines and try on personas to learn how to better understand being human. I admire other beings by watching shows, taking class, reading and traveling often to absorb, express and celebrate our wisdom. Dance is my first love and one of my main forms of expression. I fell in love with movement by watching my sister's and mother's grace. My relationship was nurtured by my family gifting me the opportunity of mentorship through endless classes, sequins and tender praise. I was bestowed the blessing of receiving a Bachelor of Fine Arts in Dance from Simon Fraser University. Now I work as a performer, teacher, dance maker and creator in various avenues. If I was a food right now I would be Lemon Gelato because I hope to be a sweet and refreshing energy for all. Also, unsurprisingly I dream of eating gelato in the sun frequently. I nurture my creativity by taking classes in painting, creative dance, Coppeira, tai chi, song writing, singing, jive dancing, and choir every week. I meditate and practice visualization regularly. I study film acting techniques. My relationship to my art form of creative dance is to enjoy self expression through exploring movement patterns emerging from the right brain and then shaping these explorations into choreography. If I was food, I guess, I'd be white rice. Why? Because I'm a 3rd generation Canadian born Chinese regular dude who drinks beer, watches football, teaches tai chi, and participates in the arts. I believe in being integrated. White rice goes with everything but it's not pure and politically correct nor evenly brown. I nurture my creativity by working with people I like on projects they are excited about. For me dance is a way of connecting with other people who enjoy movement and exploring a physical language for storytelling. If I were a food I’d probably be a pot of nicely steeped Superior Roast Iron Buddha. Jenna began her dance training at age four in Calgary, Canada where she has studied Ballet and various Contemporary dance techniques. Jenna holds a Bachelor of Fine Arts from Simon Fraser University, has completed various RAD Ballet Examinations, and has had a wide variety of performance and training opportunities across North America and Europe. In the various dance projects Jenna is currently working on in Vancouver, BC, Jenna has found much joy in continuing to nurture her creative impulses through engaging with a diverse group of members within the dance community. From working on her own projects to working under the direction of choreographers such as Desirèe Dunbar, Jenna has continued to deepen and explore the different directions of dance, furthering her love of this art form. If she were to "be a food", Jenna would be chocolate mousse. Why? Because chocolate is amazing. Dance is a part of my life. Imagine an empty space which you enter via a creative passage: it needs to be filled but not in a possessive way. You enter this space consciously, with care and with expression. Moving in space is nothing else than dancing: by moving in space, I dance. Dancing is communication, with your body and spirit and with the outer world. To communicate requires by definition to listen and to share. And it needs curiosity. Learning is an essential part of creativity, and thus by communication, I learn, and by learning I feed my creativity. I would love to be a chanterelle: this mushroom can’t be grown in a hothouse or farmed. Rather, the yellow beauty hides in the forest and makes it hard to get harvested. It has its own will and wants only to be found by those who invest energy and love. When it finds the right seeker, it provides them a sensual sensation they will never forget. My creativity is nurtured by pausing to breathe in and experience what is being offered at the moment. The offering might be planned...or spontaneous...and as well as providing me with creative nourishment and inspiration, excitement and challenges might appear. It is my intention to be open to and offer my full attention to these precious creative moments. My relationship to dance is an expression of my joy of creative movement...moving from the inside out. Dancing with others expands this joy and provides me with great satisfaction when we are able to breathe, interact and move as one. To me, dance is like a symphony of sounds...or a master painting...but the elements that create this art form are movement and timing. If I were a food right now, I would be a strawberry sundae...fresh strawberries, with home made vanilla ice-cream. As a Classical pianist, most of what I do is based on performance of musical works written by the old masters. As the music has already been written and cannot be changed, the role of musicians are very similar to that of actors, in that we interpret what is written on the page and attempt to bring it to life. For me, I garner inspirations from a varieties of sources, from other musicians, artists of other disciplines, to even seemingly unrelated things such as science, video games and food. I have an inquisitive nature ever since my childhood. I find asking questions and keeping an open mind to unexpected answers to be immensely helpful with my creative side. Music has been an important part of my life ever since I was a child. I can’t imagine living without it! I am a firm believer that music is connected to every aspect of life and I strongly oppose the notion of the division of arts and sciences as two separate and opposite entities. One dish I discovered when I was travelling in Italy: Prosciutto e melone. Who knew that salty meat and sweet cantaloupe goes so well together! And come to think of it, why did I assume that they won’t? I nurture my creativity in its many forms through creating and performing music on my own, writing poetry, and of course through movement. I have the honour of creating music with talented people in the band that I'm in, challenging myself to try new things and broaden my abilities in my own solo music career, and getting to explore my choreographic side when dancing with Dezza Dance. I have been dancing since I was 2, and movement has always been an integral part of my life. I danced at a community centre for many years before moving to Arts Umbrella when I was 10. I trained at Arts Umbrella in their dance company for 7 years as part of their semi-professional program, having opted out of the professional stream. I have performed on stage for several dance companies, as well as independently choreographing and performing numerous dances for a youth festival and Leg Up! Contemporary Dance Festival. My relationship to dance is always changing and being reimagined, growing with me as I move into adulthood. If I were a food right now I would be a plantain fruit. Almost like bananas, but not quite. At this time in my life I am totally drawn to strawberries, and I see myself as needing that nurturing of rich soil,warm sun, the help of bees and other resources in the universe to help me grow and be the best possible berry that I can . Through dance I have found an nurturing environment which has given me an opportunity to express myself in a soulful way and brings me joy! I never believed I had any creativity, because I could not paint a beautiful picture, write a poem, but I have found a creative being within myself through movement/dance ; now I can define creativity as more than an end product but as a way of moving and being in life- whether it is through baking, dancing, journal writing, or how I relate to others in my world. So I have continued to nurture "my creativity" through giving myself time to meditate , so I can stay in touch with my inner self, by continuing to take pleasure and pride in baking for my family and friends, and by continuing to dance with an amazing group of other dancers, who have inspired me to move in ways that I never believed possible and have helped me in my growth as a dancer. I am so grateful for the opportunity to be part of an inter-generational dance group under Dezza Dance, and a thank you to all of you who have continued to be a source of inspiration! Freedom to move while accepting/embracing all current physical limitations. Any body can dance! Joy of movement to music - rhythms either external or internal. Joy of moving with groups of dancers in choreographed unison or improvised pieces. Joy of self expression and allowing yourself to feel the full range of emotions. I feel most creative when in a semi-structured, non-judgemental, nurturing environment. I take inspirations from music, words/text/stories, visual images, and other sensory inputs - yes, including food inspirations! Creativity can be contagious and synergistic so I like to connect, collaborate and share with others. If I were a food, I would be Crème Brule - having a warm, but tough exterior that is cool, smooth, sweet and tender under the surface. I nurture my creativity by following my intuition. By allowing time to be by myself. By focusing on doing what I love to do. For me, dance is a form of therapy: a way to throw off any tension and any negative energies stored in my body, allowing me to be youthful, light and joyful. Dance is also my happy panacea to alleviate my suffering. Socially, I feel connected with others. Mentally, my mind becomes sharp and clear. Emotionally, I am happy, peaceful and content. Psychologically, I have no depression or emptiness. Physically, I have no pain in my body—specifically in my joints and muscles. Spiritually, I feel myself going beyond my physical limitations and touch upon a higher dimension of myself. If I were a food I would be kimchi, a traditional Korean, fermented side dish. To some, kimchi only tastes hot, salty and spicy. However, to others, kimchi is delicious, healthy and very addictive. Like kimchi, my hot temper sometimes makes me too much for others to handle; yet at other times, my caring, nurturing energy could be very supportive of others in many ways. Watch the trailer below (filmed by Willan Leung). With the hauntingly beautiful sounds of The End Tree (viola & cello duo) and the dynamic dancing of community, emerging and professional dancers. Thank-you to everyone who has made this production possible! Loved it!! Loved it!!! So appreciate the opportunity to have seen it! Thank you, so much, again for No Place Like Home! There was quite a lively conversation on the way back to the North Shore afterwards as we were very impressed by the dynamics of the way in which the community was integrated into the performance. My first thought in hearing that it was going to be a “progressive performance” was that I wasn’t sure how it was going to all work out. However – having seen the performance, not only did you integrate community members along with professional dancers in the presentation but the whole audience was engaged throughout the performance. I felt, in moving through the House, that I was actually one of the performers somehow. 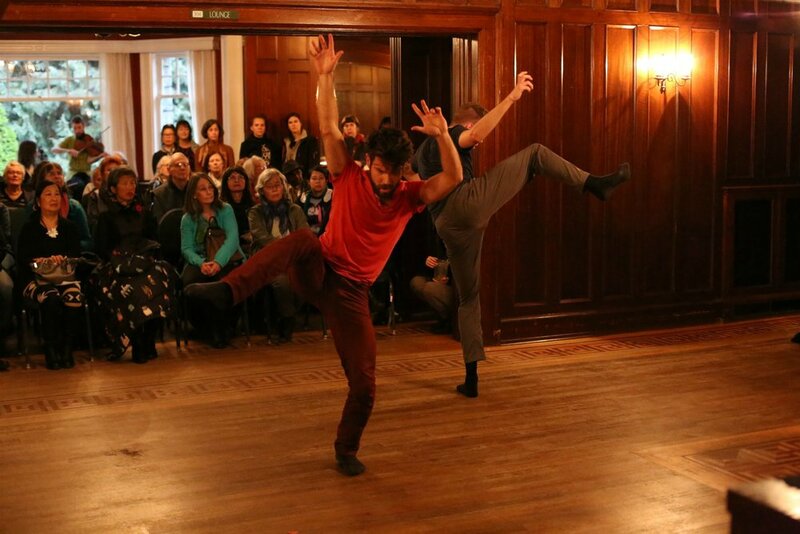 Emerging and joyfilled community dancers in a magnificent mansion setting. Truly There is No Place Like Home. 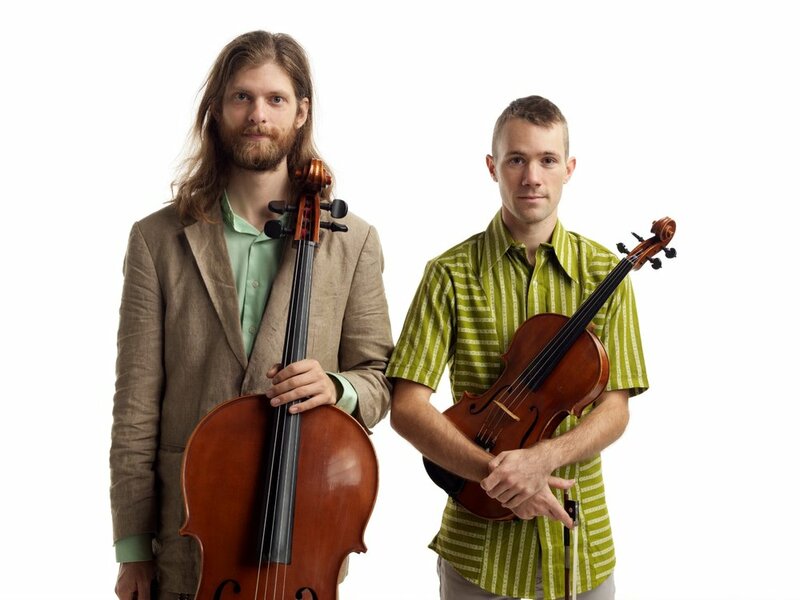 The End Tree is the Vancouver-based collaborative songwriting project of Elliot Vaughan (Viola/Voice) and Martin Reisle (Cello/Voice). A unique brand of hallucinatory, melodramatic chamber-pop. Songs for strange and beautiful margins; intense, absurd, soft, playful, intricate. Something like if Béla Bartók ran the Dirty Projectors as a string and vocal duet. In addition to The End Tree, they work with David Ward, Only A Visitor, Wake Owl, Jay Malinowski & The Deadcoast, Maria in the Shower, Very Good, and collaborate regularly within Vancouver’s Dance and Theatre communities. The End Tree recorded and self-released the EP Everything is Strange in 2012, and plan to release a full-length record in 2017. With Jay Malinowski and the Deadcoast they released the Indian Summer EP (2013) and the full-length Martel (2014). In 2012, they joined the six-week Revival Tour of Europe with Chuck Ragan, Cory Brannan, Emily Barker, Rocky Votalato, and Jay Malinowski. In Canada, they have performed in Montreal, Toronto and Vancouver.